Although specially developed for use on wet artificial surfaces, the Gripper provides perfect traction on dry or natural turf surfaces too. In any play situation. the Gripper’s 120 rubber studs maintain perfect ground contact at any foot angle. And no matter how tough the going gets, special protection of heel and Achilles tendon areas minimizes risk of injury. With its quality oxhide uppers and stitched and glued shell sole, the Gripper is one of the most hard-wearing football shoes around too. 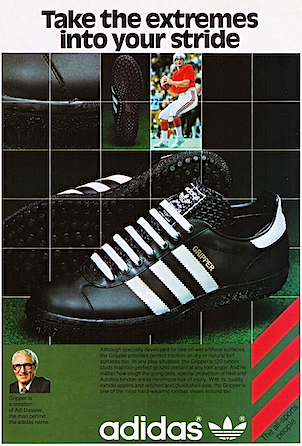 Gripper is a creation of Adi Dassler, the man behind the adidas name. 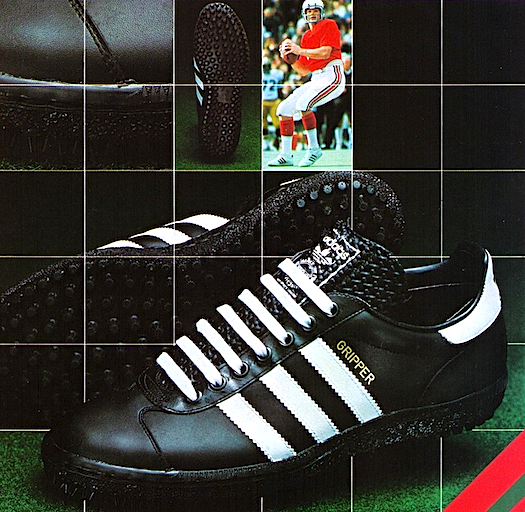 adidas Star football shoe "Weather for ducks … and the star"
adidas shoes "Get the ball moving with adidas!"